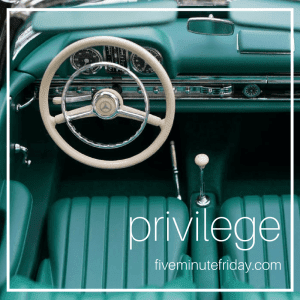 The Five Minute Friday prompt this week is Privilege. Thanks Kate for hosting this every week. The definition of privilege is a special right, advantage, or immunity granted or available only to a particular person or group of people. You hear people all the time saying someone else is more privileged than they are but I think it all depends on how you look at things. No matter who you are or how your life has panned out you are privileged in different areas. Someone may have more money, a bigger house, more education, or more talents. I'm sure if you look at yourself you can find areas that you are more privileged than someone else. Do you have good health? Do you live in a country that allows freedom? Do you get to attend school? Own a cellphone? Have a roof over your head? Have food on your table? What about snow? We have had more snow this year than we have had for a long time. Some people may think we are privileged to have so much. All these things and many more can be looked at as a privilege. Do you tend to take your privileges for granted and dwell on what other people have in their lives and not what you have been blessed with. I had to laugh because I too started with the definition of privilege. Thank for the questions. I agreed on perspective being everything. Blessings! Stopping by from FMF!